After working a bit on the Sons of Horus I have managed to paint a some rats for my ever growing army. 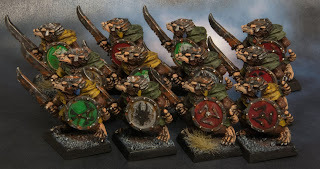 I have painted 12 plastic clan rats using the usual techniques. Main colors are brown and green with a bit of red on some shields. The shields used are the original ones, that show a mix of different icons. I wanted to know how many points I have painted so far so here is a small recap. Note that I have used italics for 4th edition. Which means I am getting closer to the 1500 barrier but I am still not able to fill up the minimum amount of rats needed for a basic clanrat unit. So that will be my next target, painting another 10 or 20 of those.